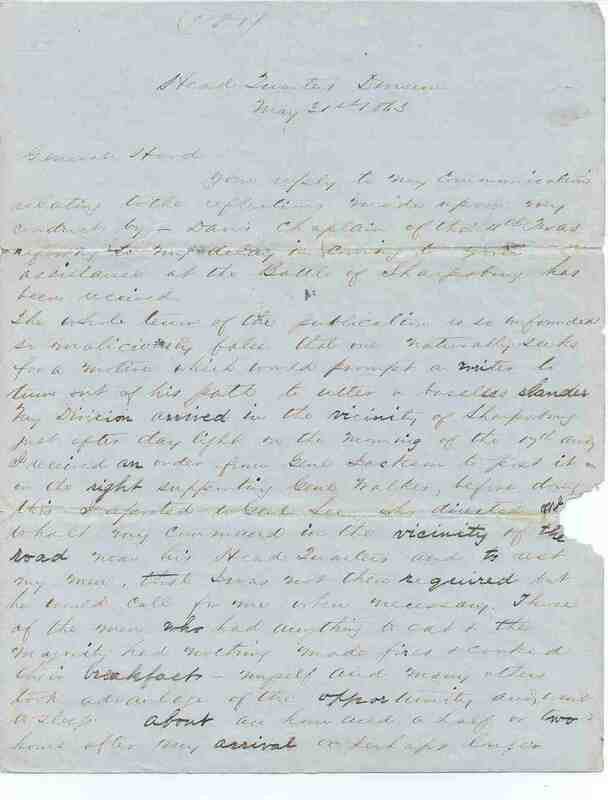 Item description: Letter, dated 31 May 1863, from Major General Lafayette McLaws to General Hood, defending McLaws’ leadership at the Battle of Antietam. Item citation: from folder 7 in the Lafayette McLaws Papers, Southern Historical Collection, Wilson Library, University of North Carolina at Chapel Hill. Your reply to my communication relating to the reflections made upon my conduct by Davis Chaplain of the 4th Texas, refering to my delay in coming to your assistance at the Battle of Sharpsburg has been received. The whole tenor of the publication is so unfounded so maliciously false that one naturally seeks for a motive which would prompt a writer to turn out of his path to utter a baseless slander. My Division arrived in the vicinity of Sharpsburg just after day light on the morning of the 17th and I received an order from Genl Walker, before doing this I reported to Genl Lee, who directed me to halt my command in the vicinity of the road near his Head Quarters and to rest my men, that I was not required but he would call for me when necessary. Those of the men who had not had anything to eat & the majority had nothing made fires & cooked their breakfast – myself and many others took advantage of the opportunity and went to sleep. About an hour and a half or two hours after my arrival or perhaps longer I was aroused and told that my Division was wanted. I immediately mounted my horse and rode to the Head of my command then under way and met you on the field, etc. My command crossed the river before day light and Genl. Barksdale tells em that he recollects distinctly when a mile from the river, he wished to get some water to drink but it was then so dark he could not find the well. I rode ahead and went into and beyond the town of Sharpsburg looking for Genl Lee or some one from whom to receive information and directions but saw but one or two persons about the place. When returning I met Genl Longstreet and staff going to the front and he told me where Genl Lee was. Everything at that time was perfectly still. I did not hear a gun or a sound denoting the vicinity of a battle field. In my report of the operations of my command I stated that some troops were retiring as mine went in but whose they were I did not know. As regards the publication in the Illustrated News concerning myself, I have never read it but Maj. Goggin, my Adjt. Genl tells me that your name is not in it. I have thought it best to be this minute as to the arrival of my command in the vicinity of Sharpsburg in order that you can judge how maliciously false is the publication in the pamphlet of the Texas Chaplain that pamphlet which is devoted to a glorification of yourself and the Texas brigade, of which he was a member, is or would be all very well in itself and no one would object to such a harmless production of his favorites by clouding the fair fame of others. I find that the pamphlet has been industriously circulated, and as I have been attacked in it has become a necessity for me to defend myself, as I dislike very much to be drawn into newspaper notoriety, nothing is so repugnant to my sense of propriety as a military man. I am very glad that you have denied that the pamphlet of Mr. Davis’ was published under your auspices for I tell you frankly that it has been the opinion of many who have read it, that you must have been a party to its publication or must have known its contents before publication. 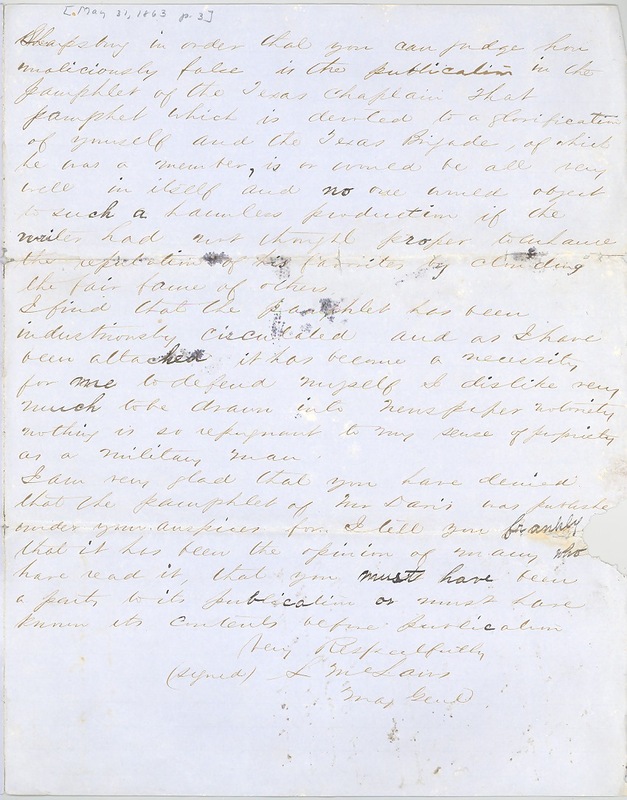 More about this item: The battle referred to in this letter was known in the South as the Battle of Sharpsburg, but is better known as the Battle of Antietam. A copy of the pamphlet that General McLaws refers to in this letter can be found here. 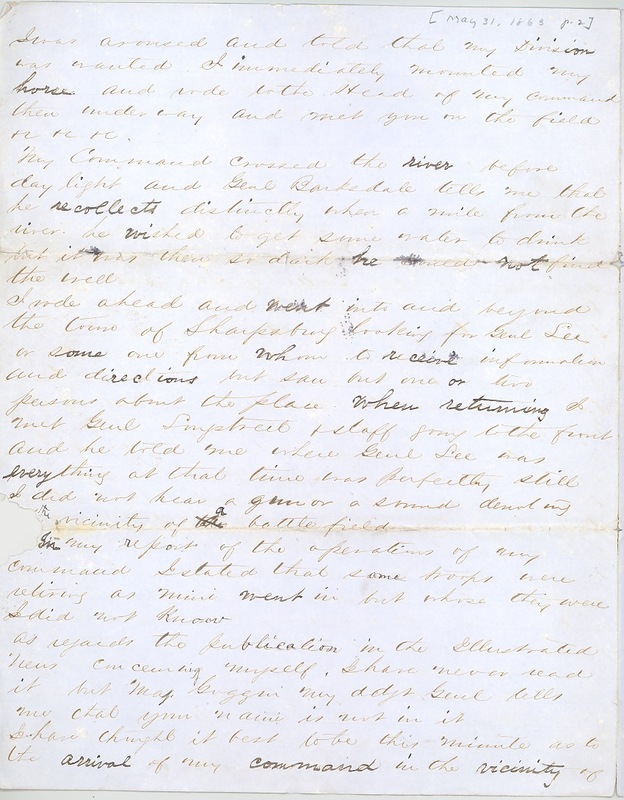 This entry was posted in Southern Historical Collection and tagged Battle of Antietam, Battle of Sharpsburg, John Bell Hood, Lafayette McLaws. Bookmark the permalink.